Nigeria is the most populous black nation in the world, it has a population of over 180 million people. The country has 3 major tribes, although it has over 250 ethnic groups, with over 520 languages. Every tribe has a special way of living, such as marriage, art, food, dressing. These are what makes the country an interesting and attractive place for foreigners. Customs and traditions differ across the various tribes. The tribes have different ways of doing things and celebrating. Nigeria is a multi-religious country. The predominant religions are Christianity, Islam and the traditional religion. The majority of the Northerners practice Islam, while a small percentage of them practice Christianity. The largest amount of Southerners are Christians. Christianity (Catholicism and Protestantism) is what is practiced mostly in the southeastern(Igbos) part of the country, however, it’s a blend of Christianity, Islam, and traditional religion in the South Western(Yoruba) part of Nigeria. It might be surprising to know that, even though these people have embraced foreign religions and cultural values, their acts and behavior are still deeply rooted in their culture. A wedding is a big deal in Nigeria. Each tribe celebrates its own differently, but there is a similarity in the way marriages are celebrated. It begins with what’s called introduction. This is when the man shows interest in the lady by going along with his family to the family of the lady to show official interest in the lady. This is usually a parlor event, with about 15 people in attendance, however, some families turn this into a fanfare, with many people in attendance. The date of the wedding is proposed on this day. The next phase is the traditional wedding. This is the most important part of the wedding activities. It’s usually done a day to the wedding, although, some couples would like to do the traditional wedding in the morning of the wedding day, then the white marriage later in the day. The traditional wedding is always a beautiful event. 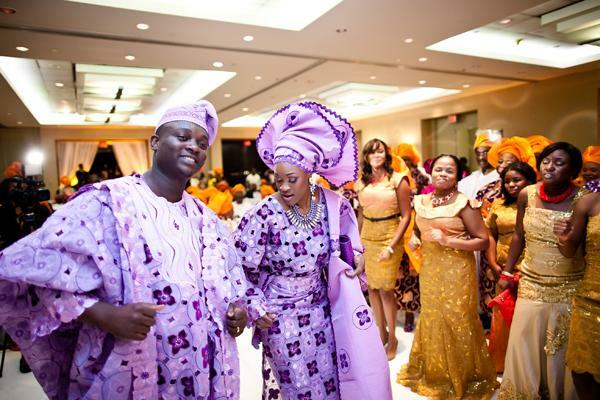 People would come to the ceremony looking glamorous, exotic and traditional.